Sibiu, one of the most picturesque towns in Europe, offers its eager visitors, a plethora of things to do. The town hides away in the lush and mountainous landscape of Transylvania. The pastel colors façade will have you snapping shots at every step, and the unique architecture will make you doubt if it's even real life. It’s a place you can’t skip when you visit Romania. Before my first trip to Romania, I knew very little about this beautiful country nevertheless, how colorful it was. It took a second trip to Romania to discover its dreamy pastels-colors cities and realize how much I missed out on my first visit. I hope you don't make the same mistake. Sibiu, also known as Hermannstadt in German, was founded by Saxon settlers in the 12th century; which explains the distinctive architecture and culture from the rest of country. The city is divided into two levels: the Upper town and the Lower town. Historically, the Upper town was the wealthier part while the Lower town was reserved for the peasants. But given how colorful the houses are amid cobblestone roads, I would be happy to live in the peasant level anytime. Stroll down the beautiful promenade amid colorful buildings, shops, and restaurants. 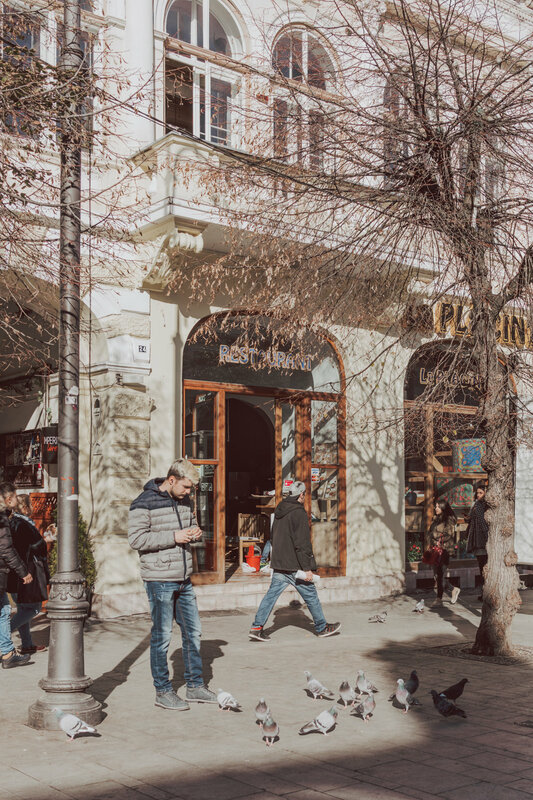 The pedestrian boulevard is Sibiu’s main shopping area and a great place to wander around. Restaurants are on the touristy side so save your appetite for a more local fare. Taste the Romanian version of pretzel, Covrigi! You will find the traditional baked good at any bakery or food stand. Although the origin of it is up for debate, there is no doubt that locals and tourist alike will line up for this tasty treat. Covrigi is usually topped with big salt grains, poppy seeds, or sesame seeds. Sibiu’s main town square, Piata Mare, is a must when visiting. The buildings surrounding the square are some of the best-preserved in town. It also makes an excellent starting point for exploring Sibiu as the plaza is nearby many attractions like the Brukenthal National Museum, Lutsch House, and the Council Tower. The Council Tower is one of the most prominent monuments in Sibiu. It’s hard to miss while exploring around. For a small fee, you can climb to the top for a beautiful view of the town. Totally worth it! Grab a cappuccino at one of the many coffee shops at the Piata Mica. Although the plaza is not as famous as the main square Piata Mare, it’s charming plaza to enjoy a coffee break surrounded by centuries-old buildings. A trip to Sibiu is not complete without crossing the Liars Bridge. The beautiful bridge not only serves as a pathway between Piata Mica’s two sections but also as an access point between Upper Town and Lower Town. Although the bridge isn’t an imposing monument, it's an essential piece of Sibiu's history. Some people may say Sibiu’s main attraction is the Lower Town - and they may be right. Wandering around the colorful houses amid cobblestone roads was my favorite thing to do in Sibiu. Meeting a few locals along the way, made it all feel even more authentic. 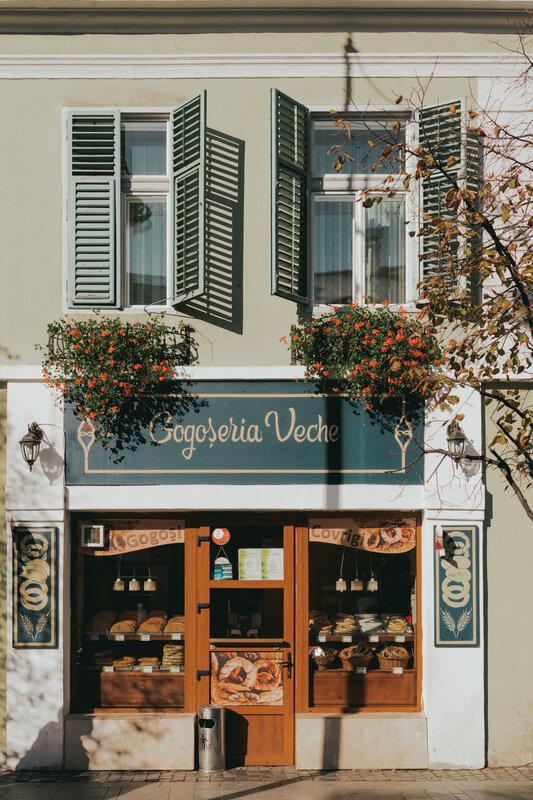 Despite it lacking some historical buildings compared to the Upper town, the Lower town exudes more charm with local businesses, twisted roads, and alleyways. Culinary experience is always a must for me while visiting a country. I mean, what better way to understand your host country than by experiencing its cuisine? During my visit, I dined at Monsieur Joben. The modern restaurant headed by chef Ali B., treated us with a feast of traditional Romanian dishes elevated with a modern twist. There's no shortage of small alleys for you to explore in Sibiu. You never know what you will see at the other end so go ahead and explore - you may find a few hidden gems. They also make beautiful photo op. Daily trains depart from Bucharest directly to Sibiu. It takes about 5 hours and cost about $6. You can also find direct trains from Brasov, Sighisoara, and Cluj to Sibiu. You can find the train’s schedule here. Note: When inputting Departure type “Bucuresti Nord” or “Bucuresti Aeroport” for Bucharest. Sibiu has excellent bus connections with Bucharest and Cluj-Napoca. From Cluj, buses depart hourly. The Republique Hotel is a super charming boutique hotel conveniently located in the center. It’s only a short stroll away from Piata Mare and many other attractions. Newly renovated, the hotel offers a mix of modern and old-school charm. Sibiu’s temperature can range from 80 F to 56 F in the summer and 36-19 in the winter. The most popular time to visit Sibiu is in the summer (Jul-Aug) when the sun is out and the temperatures are mild - perfect to embark on all the things to do in Sibiu. If you plan to visit in August, don’t miss out the Songs of the Mountain International Folklore Festival. The town comes to live with costume parades and folk music! Visit December, and you will find the Christmas Market in Piata Mare. I visited towards the end of October and although it was cold, I loved how the picturesque town was slightly dusted with white snow. I was invited by Experience Romania, the largest independent project to promote their beautiful country, to visit. As always, all opinions are my own. Would like to visit Sibiu? Pin it!